Accommodation options at their refurbished Dandabah Getaway Units are the one room studios or two bedroom apartments. 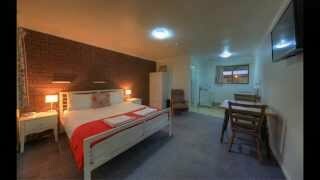 The contemporary studio rooms comprise a comfortable queen size bed, an en suite and kitchenette. The two bedroom apartments are appointed with a range of functional features such as fully equipped kitchen, lounge with fireplace, separate dining room space and two bedrooms - one with queen bed, the other with two singles. You have the best of both worlds by being centrally located near the General Store, The Bunyas Coffee Shop and Tavern, yet still experiencing the serene surrounds of the Bunya National Park at your doorstep. Entrances to the National Park walks are just 200 metres away making these Getaway Units the ideal base for bushwalkers, bird watchers and nature lovers! These spacious, fully self-contained units have recently received a facelift with new kitchen, bathroom, beds and televisions. The lounge area is complete with a wood fire for those cool nights and undercover parking is provided to keep your car protected from the elements. 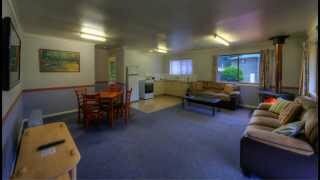 You don't even have to leave your residence to take in the beautiful views of the Bunya Mountains National Park. Great value for money and ideally located next door to the General Store, Elz Bistro and Lyrics Restaurant where you have all the amenities at your fingertips. The walking track entrances to the Bunya Mountains National Park are just 50 metres away - pick up your free walking map from the General Store. Their stylish Getaway Studios feature a well-equipped kitchenette and a new queen size bed and television. Undercover parking is included so you can park your car and forget it until you have to leave. Located right next to the general store and restaurant these units are also the closest units to some of the more popular walks in the national park.